It is so hard to make sure our dogs are getting good, healthy food so we wanted to make sure you are updated on the recent additions to the pet food recall list. P&G Procter and Gamble’s Natura Pet Products make a lot of pet food including a few very popular lines for Italian Greyhound owners looking to give their iggies ‘the best.’ It is with sad news we learned they have expanded their recall list due to potential Salmonella contamination. 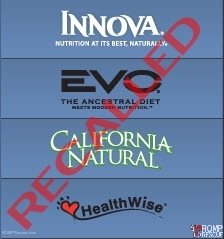 The brands effected include California Natural, Innova, EVO, Karma, and Healthwise. If you own one of those brands, check the package and if produced between December 14, 2012 and March 24, 2013 please isolate and cease feeding your pooch. See below for additional measures as that dog food may have been effected. There was a single case of Salmonella reported from EVO Turkey & Chicken cat food on March 15th, 2013 that started the precautionary pet food recall of that and other brands. All brands listed were produced on the same line at the same facility and in the same time frame. We applaud Natura on being proactive as we are well aware of many companies and brands that would not carry out such a large pet food recall, unless necessary. Please cross reference your SKU numbers with this pet food recall list but note it was last updated March 13th and the recent additions came this week. You can read the pet food recall letter sent out by Natura here which is more up to date and also includes SKU numbers effected. Common symptoms of Salmonella in humans and pets include diarrhea, fever, vomiting, and abdominal pain among other things. If you, someone you know exhibits these symptoms (especially if you handled one of the dog food brands listed) report to the doctor immediately; if your dog or a dog you know exhibits these symptoms (especially if they consumed the pet food recall brands listed) go to your veterinary immediately. If you have any additional questions, please contact 800-224-6123. If you feel your dog may have a case of Salmonella, please contact the FDA coordinator in your area immediately. This entry was posted in ALL, News and tagged 2013, California Natrural, california natural, california natural recall, dog, dog food, dog food recall, Evo, evo recall, Healthwise, healthwise recall, Innova, innova recall, Natura, natura recall, p&g recall, Pet food, pet food recall, Procter Gable, procter gable recall, Recall, salmonella. Bookmark the permalink.